Typical reclaim systems can be an effective way to recover some of the water used, but they can only go so far. They are expensive and complicated. SuperClear is a system that relies primarily on the use of water treatment chemicals to clean wastewater without the need for costly filtration filters which typically clog and cause units to malfunction leaving the user without the use of their system. SuperClear is a system that is less complicated and less expensive to operate than other treatment systems. Using SuperClear in your wash, will increase revenue and improve wash quality. SuperClear is the only water treatment system in the industry that operates without the use of filters, thus eliminating the usual downtime caused by when they are clogged. Furthermore, wastewater treatment systems often include expensive and complex equipment that may be difficult to operate and maintain. In many cases, the operators of carwashes have limited understanding of how to operate and maintain commercial wastewater treatment systems. Our patented SuperClear system takes the guess work out of it. 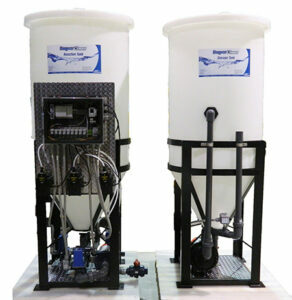 The ingenious SuperClear system is comprised of two tanks. Dirty water enters into the Reaction Tank, SuperClear Combine 100 and Drop Out 200 are pumped into the tank. The system allows time for the proprietary coagulants to react to the dirty water and eventually causing them to drop to the bottom of the tank. Once the dirt settles to the bottom, the system purges this collected dirty and contaminated water out of the system. The clean odor free water is then automatically pumped into the Storage Tank to be cycled back into the wash process.